The first sneakers that I got that weren't cheap Chuck clones were a pair of adidas "Gym" in the summer of 1972, between my junior and senior years of high school. 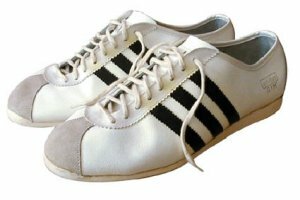 The "Gym" was a white leather sneaker with black stripes. The worst design feature was that adidas used a "grid of squares" sole similar to the Puma Basket and Clyde. This type of sole is usually slippery on wet grass, and the "Gym" was no exception. I had a friend with a pair of Puma shoes with the same outsole design... Ronnie and I both did our share of slipping in gym class! They also didn't have any midsole cushioning to speak of, so I had two reasons that I was more likely than not to wear the red low-top Chucks I had by that time in gym class. Even with this flaw, these shoes went with me to college. I found the third flaw in these shoes walking across the University of Missouri campus: they wore out quickly! They soon went into the trash.